Creating Our Home: 31 Days of Activities Based on Children's Books- Where Is The Green Sheep? 31 Days of Activities Based on Children's Books- Where Is The Green Sheep? 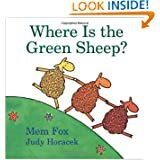 Today we read the book, "Where Is the Green Sheep?" by Mem Fox and Judy Horacek. This is an adorable book about opposites and has a fun recurring question. (Where is the Green Sheep?) I work in child care and have read this to groups of children ages 2-4. They all seem to love it! After we read the book, I got Aubrey set up to create her own green sheep. After she cut out the sheep, I had her color the cotton balls and then glue them on. She found the sheep and then my girls took turns hiding and finding the sheep. They had a blast! I love this idea for a 31 Days series! great series! And we LOVE this book at our house! !